The last time I tried to make homemade falafel it was not pretty—maybe a rookie mistake but I put those bad boys into a deep fryer and next thing I knew they had disintegrated and I was cleaning up hot cumin scented-oil from every surface of my kitchen. In times like these, it makes me sad to think about all the time I had invested preparing ingredients, all for it to be ruined in a matter of seconds. Fueled partially by the desire to save time and partially by having a whole bunch of tabouli and avocados on hand, this one is for all of you who don’t have any kind of time to soak chickpeas. I suggest wrapping these two up in a pita filled with your favorite greens or roasted vegetables, though snacking on them ala carte is equally delicious! Sift the besan flour into a medium sized mixing bowl. Mix in the water. The mixture should be a little thinner consistency than that of brownie batter. Add in the spices, herbs, salt, sesame oil, flaxseed and sesame seeds. Mix until all the tasty goodies are evenly distributed. Heat the vegetable oil over medium heat in a large nonstick skillet. Drop tablespoons of batter into the pan. 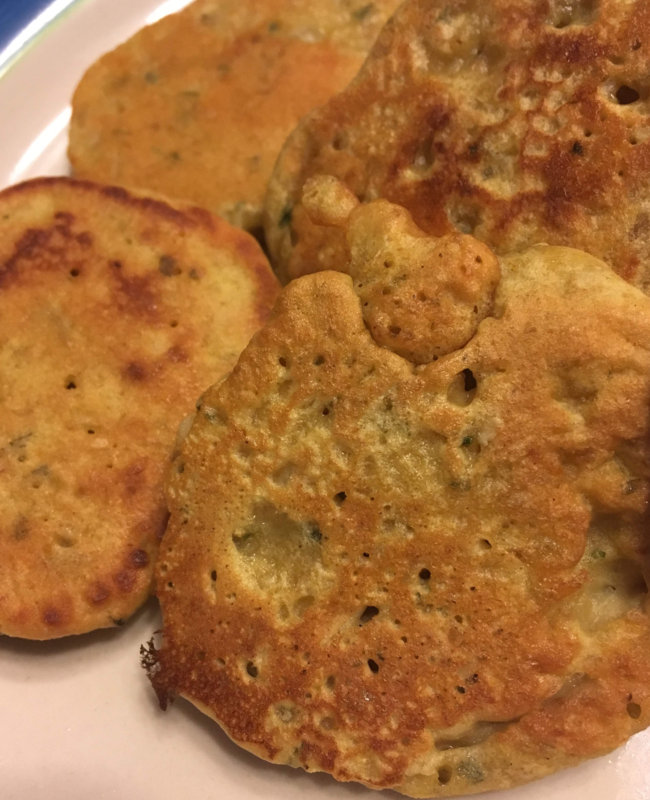 When slightly browned on one side and bubbles start to form around the edges of the wet side (top) of the fritters, flip them over and fry until browned on the other side. Continue flipping and browning until both sides are browned to your liking. 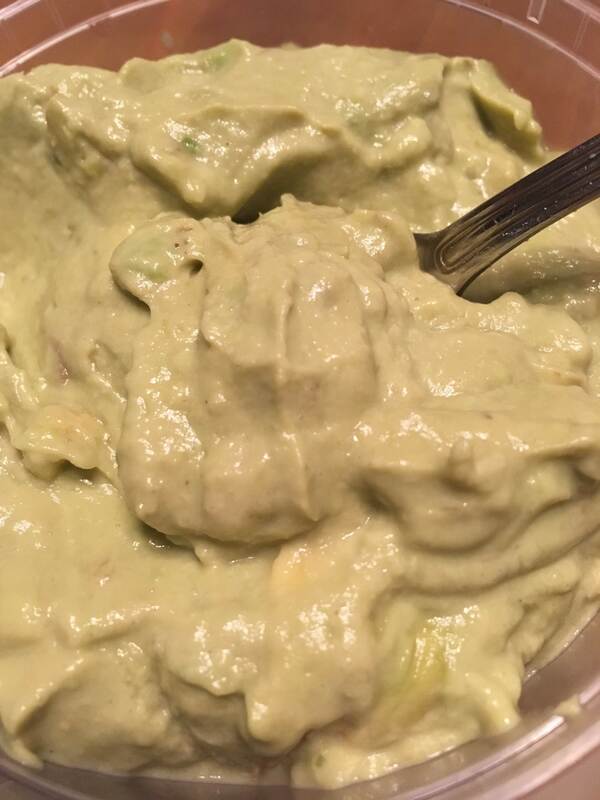 I suppose if you really wanted to, you could call this guacamole hummus, but I am sure there is some definition of hummus that requires beans or something. Maybe not. Either way, it makes for a great umami tasting sauce/dip. Smash the avocado the best you can in a small blender (As Seen on TV Magic Bullet is just the right size). Add the tahini and blend until incorporated. Add the water and remaining ingredients and blend until smooth. If you want a thicker dip, lay off the water. If you want a thinner sauce, add water 2-3 tsp at a time until you get what you are looking for. A blender will get out all those bitty chunks for a smooth finish, but if you are too lazy to get that blender out and clean it, you can whip up a pretty smooth sauce with a fork and a small bowl.